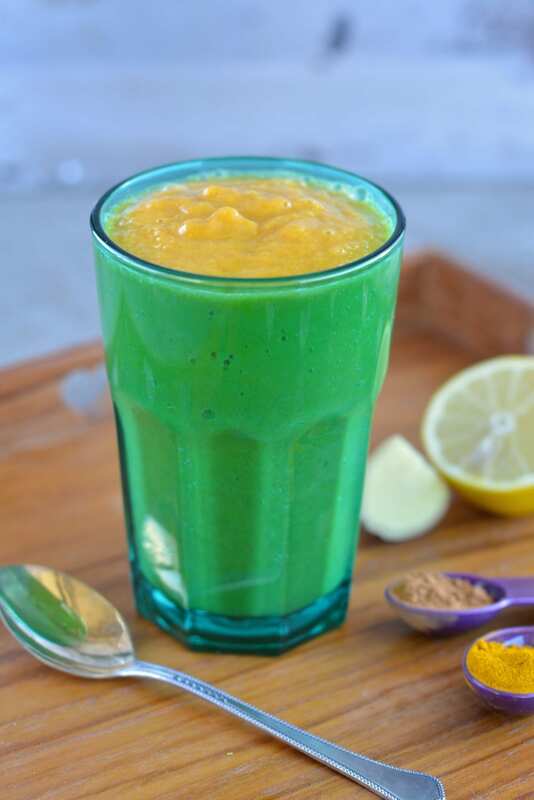 This mango-turmeric smoothie is actually my husband’s creation, as he’s the smoothie master in our family ever since we first started blending smoothies in mornings. However, he’s kind enough to let me take credit for it. I can dedicate my early hours to activities that don’t involve being in the kitchen – Tibetan hormonal gymnastics, sun salutation and getting myself ready in piece. Vegetable-fruit smoothies have been our first breakfast for a few years now. Our daily dosage of omega 3-s (flax seeds), avocado’s beneficial qualities and iodine (agar-agar) come from the morning smoothies. Our smoothies have quite high fat content (about 30% of calories), which is fine nonetheless, as we don’t consume any oils and very few nuts during the rest of the day making the average consumption of fats 15-20% of total calories by the end of the day. We have our grains in the form of oatmeal or muffin/bread an hour or two later when the smoothie has already been well digested and wouldn’t mess with the grains. 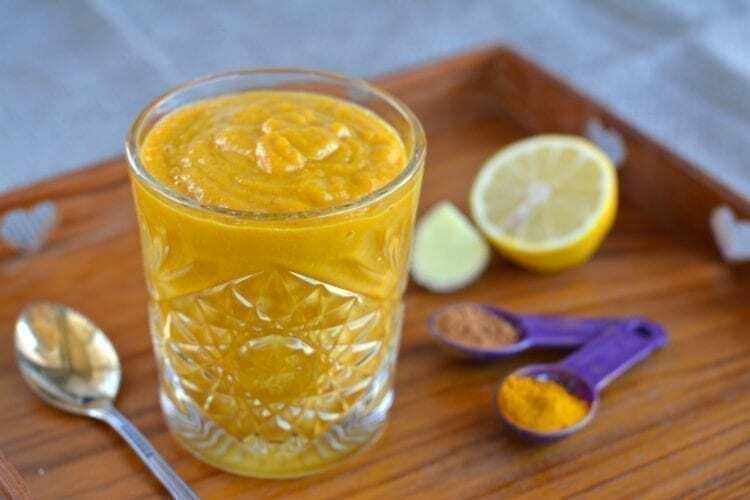 Mango-Turmeric Smoothie is dedicated to being-sick-period, as was my very popular Ginger-Lentil Soup that I posted last week. 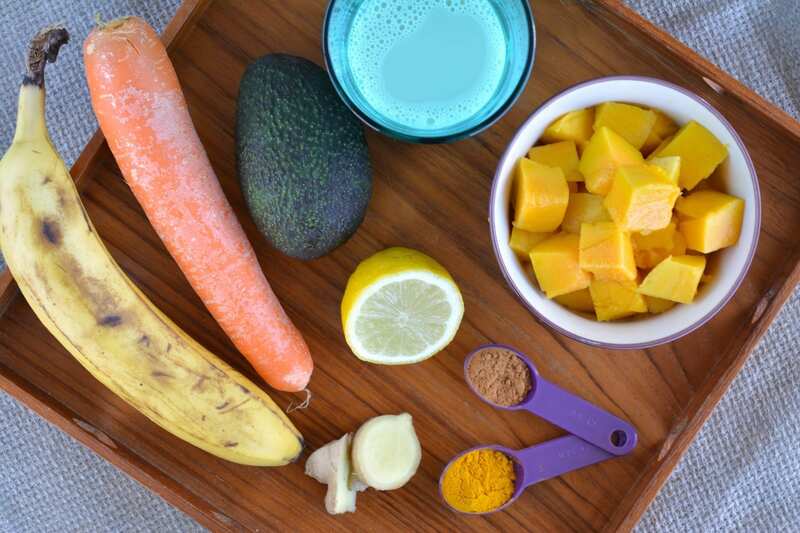 The smoothie includes well-known natural remedies, i.e. 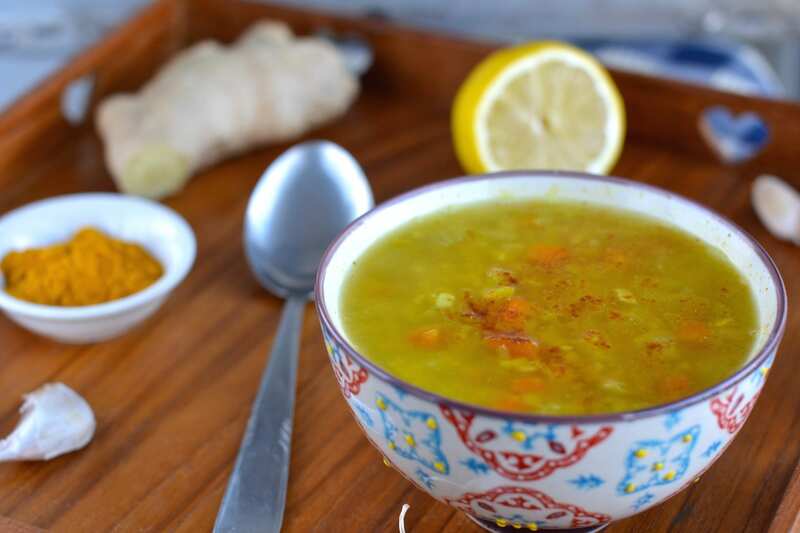 ginger, lemon, black pepper, and turmeric. We like to keep our smoothies a bit chunky and quite thick and not blend it too silky allowing the teeth to do some work as well. It’s important to chew on your carbs as their digestion begins in the mouth. Don’t make your smoothies too liquid, especially if you are trying to lose weight or are struggling with blood sugar fluctuations. You’ll consume a lot more calories and sugars (from fruits), if you drink your food instead of eating it properly. Add some whole seeds, e.g. sunflower seeds that would make you chew your food before swallowing it. Ground flax seeds also work very well, as they still remain a bit crunchy, even after grinding. 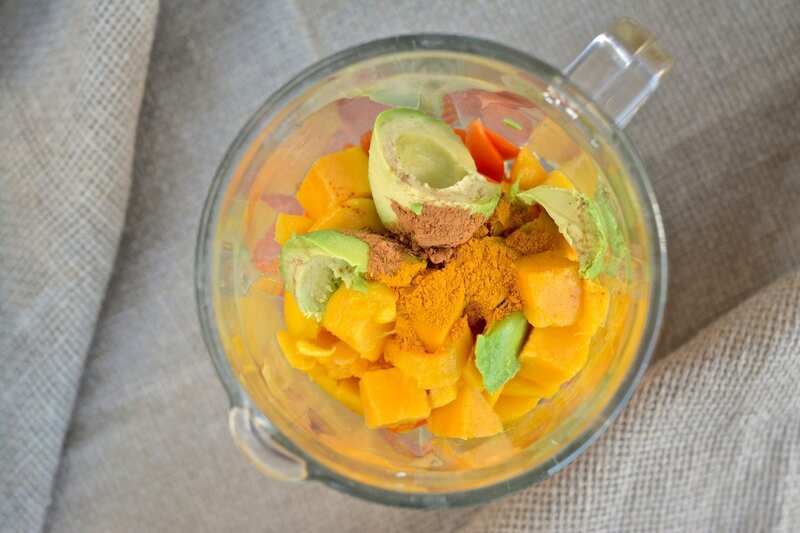 Put harder and more fibrous ingredients (carrot and ginger root) in the bottom of blender to allow them to get well incorporated. Add all the remaining ingredients and start blending using a spoon to press the mixture down. Be careful not to stick your spoon too deep while blending. It’s the safest to stop blending while using the spoon. Blend the smoothie to your liking (we like it a bit chunky) and pour into small bowls or glasses, top with whatever you prefer (wild berries or even parsley) and get chewing! 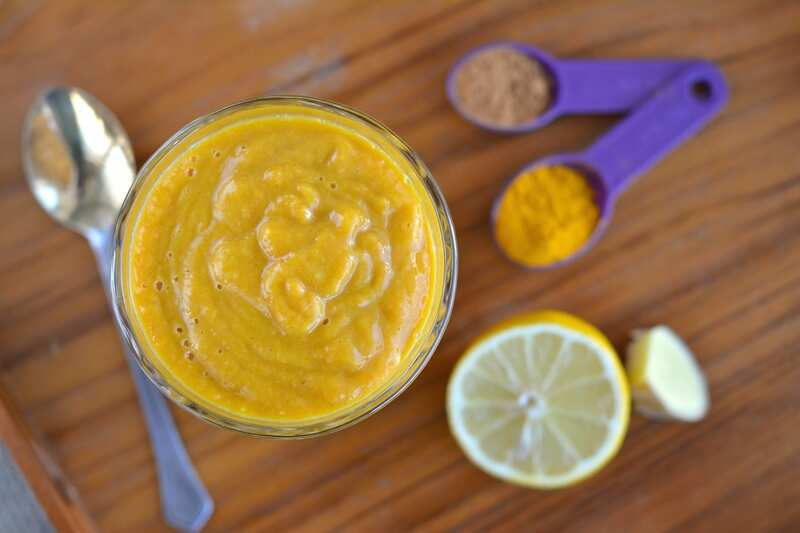 If you have blueberries at home, top the smoothie with a few to enhance turmeric absorption even further. 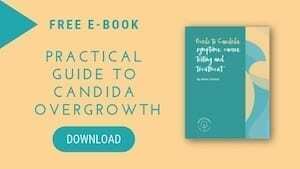 Put ¼ teaspoon of agar-agar (a jelly-like substance obtained from algae) in your morning smoothies or on your oatmeal to get your daily iodine dosage. ¼ tsp. (0.5g, 0.02oz) of agar-agar contains 180μg of iodine. The aim is to have an intake of 150μg a day. For some extra boost (if you are sick) you may add ginseng. Some studies have found that ginseng may boost the immune system. Check the dosage from package. Choose Korean (Panax ginseng) or Siberian (Eleuthero) ginseng as studies have found that those are more stimulating than American (Panax quinquefolius) ginseng. 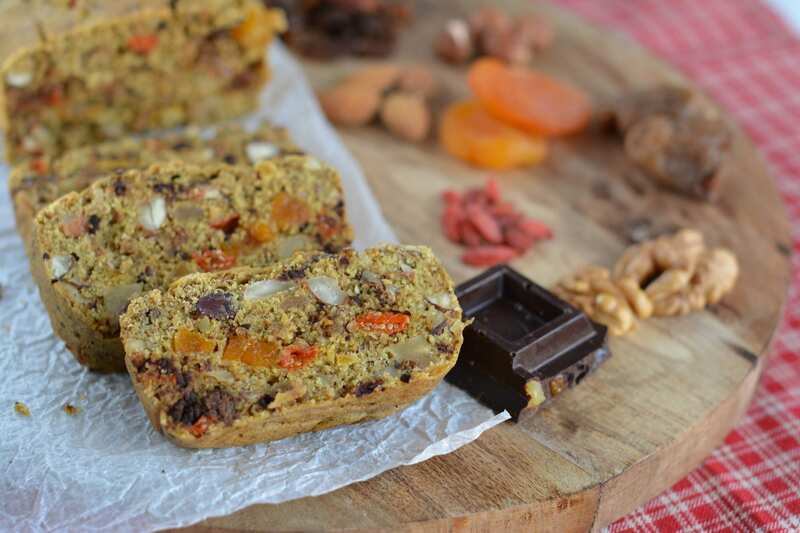 If you have problems with blood sugar fluctuation, you might want to leave the banana out. There’d be enough sweetness from mango and oat milk. Nutritional info per serving (with oat milk): 202 kcal, 30.5g carbohydrates, 7.17g fats, 3.84g proteins, and 6.83g fibres.